A flatbed trailer lies on its side in the middle of the Interstate 70 eastbound lanes near the Rifle exit Wednesday. The driver of a pickup truck responsible for closing eastbound Interstate 70 at the Rifle exit for nearly four hours Tuesday faces a series of charges for his role in the incident. 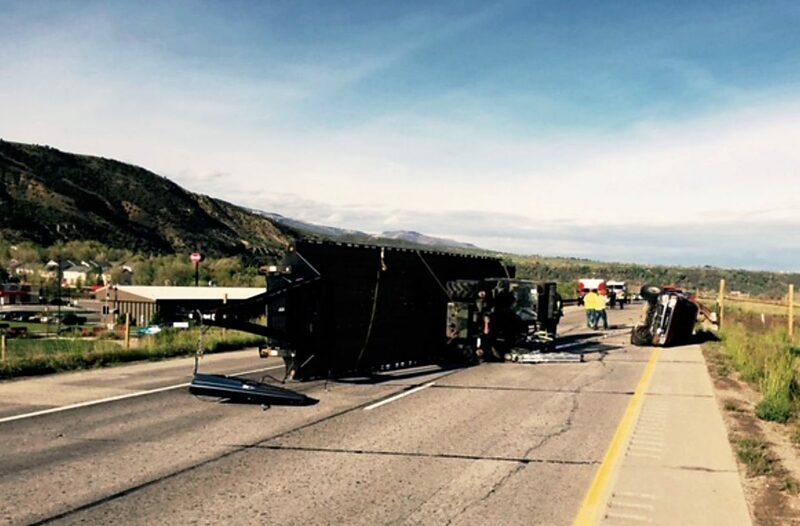 Rifle police cited Kristopher Steed, 22, Utah, after a trailer he was pulling came loose and flipped on the interstate around 7:48 a.m., said Rifle Police Officer Jose Valdez. No other vehicles were involved, and nobody was injured. A juvenile passenger believed to be Steed’s cousin also was in the vehicle. Steed was towing a flatbed trailer with a pickup truck and forklift on it when he started to fall asleep behind the wheel and began to swerve. The trailer ripped the hitch from the back of the truck when he tried to swerve back to the center of the road. The load was too much weight for the Ford F-350 Steed was driving, Valdez said. Steed was cited for not having a commercial driver’s license, a requirement for towing the amount of weight on the trailer, as well as driving without a valid driver’s license and careless driving. Colorado Department of Transportation crews reopened the eastbound lanes of the interstate at 11:41 a.m., according to Tracy Trulove, CDOT Region 3 communications manager.